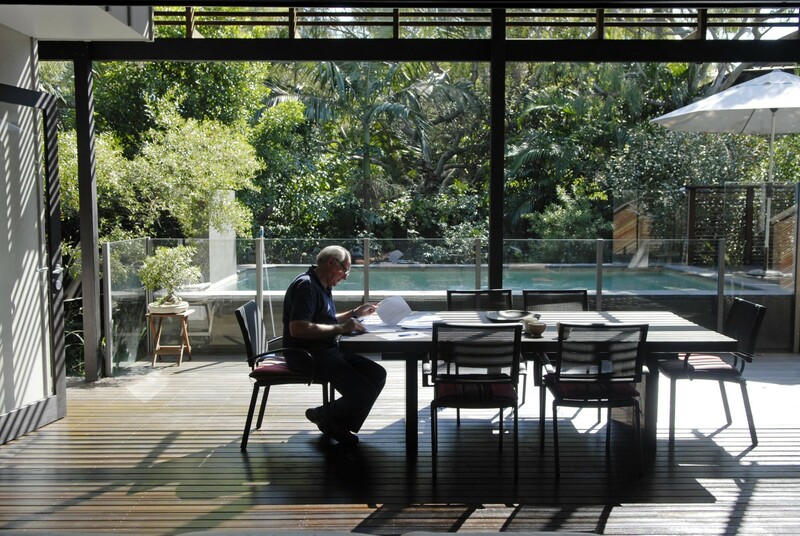 At our first site meeting with the clients, the simple plan for the Marcus Beach House was sketched in the sand as two pavilions forming a courtyard around a beautifully sculptural Moreton Bay Ash tree on the site. 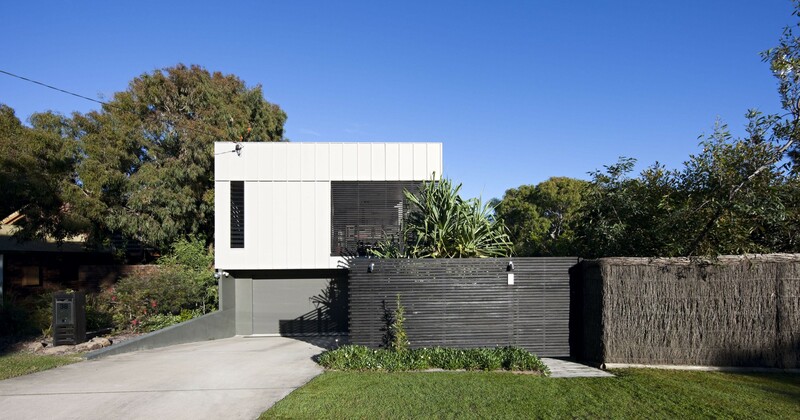 This is our first project where we have had the exciting and fortunate opportunity to revisit and renew one of Bark’s very own designs with a new client, seven years after the original build. 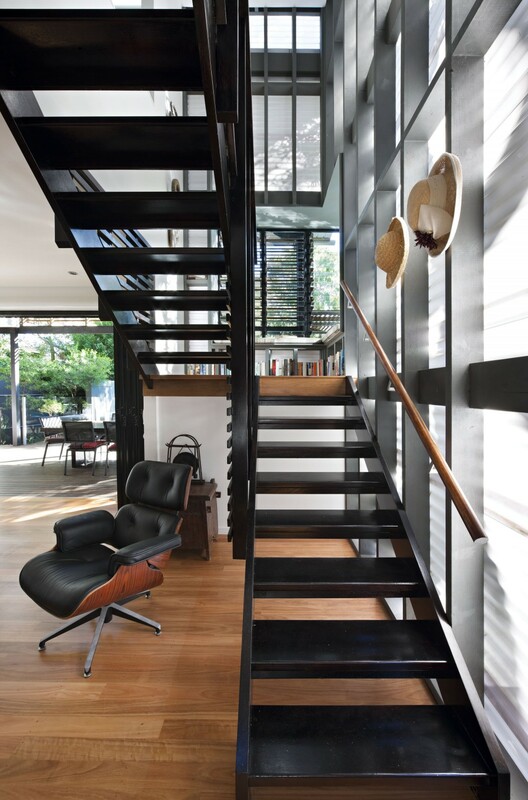 It was astonishing to see how the overall framework of the original house was flexible enough to be transformed and manipulated to suit the needs of a new owner and into a new life of its own. The original plan of this house was sketched out in the sand during an early site visit: a simple diagram of two pavilions placed either side of a venerable Morton Bay ash that stands as a decisive point upon which to base the scale, proportions and life of the house around it. The pavilions sit lightly on the site, linked by a transparent bridge in an arrangement that opens all the spaces to the light, breeze and garden views from the north. 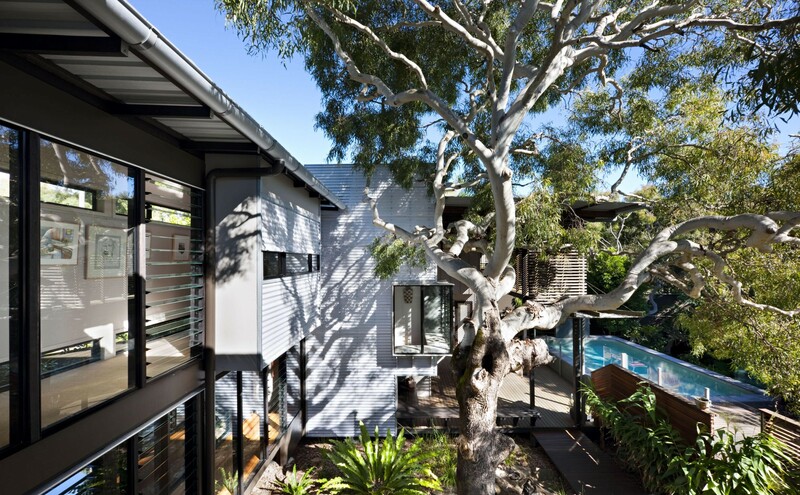 The Marcus Beach house has always celebrated its natural, coastal setting, providing its occupants with an inextricable and sensitive relationship to the landscape and the surrounding environment. In doing so it explores lightness, filtering natural breezes, layers of transparency and integrating ambiguously defined spaces that are neither indoor nor outdoor through dynamic patterns of light and shadow – all within a simple frame to enable a contemporary sustainable lifestyle to unfold. 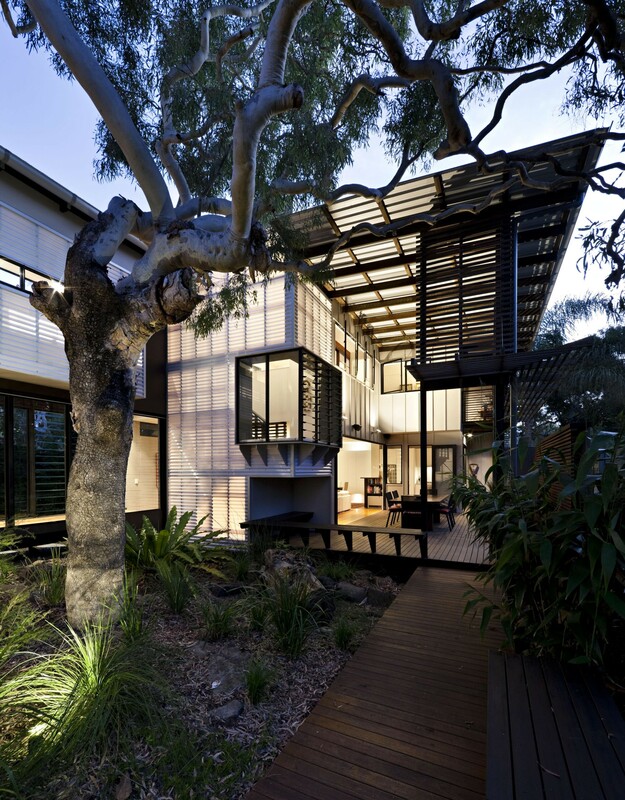 The house is open and light, using simple sustainable design principles to passively defend the occupants from the elements. 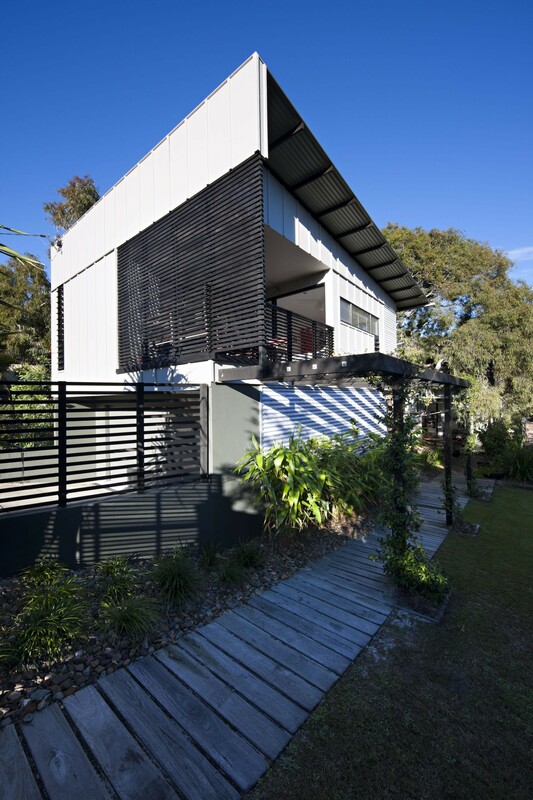 Windows and doors are strategically positioned to capture the prevailing breezes whilst roof overhangs generously protect the house from the direct summer sunlight. Any artificial lighting is kept to a minimum due to the generous amount and position of glazing, particularly facing north. Air conditioning has never been installed in the Marcus Beach House nor has it been desired. The roof over the Master Bedroom pavilion rises to the north providing a band of high level, operable, clerestory glazing that captures daylight and allows any warm air to escape. This sets up a natural and effective ‘stack effect’ cooling process. 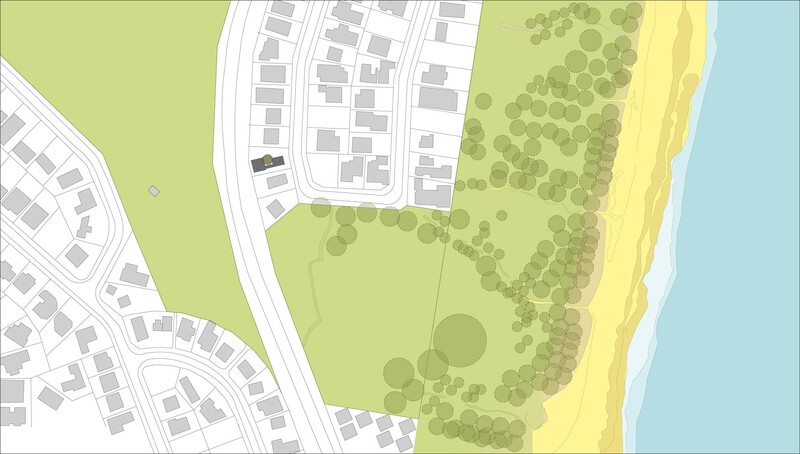 The garden is protected by a perimeter wall wrapped in endemic vines providing an acoustic ‘green’ buffer to a nearby busy road. 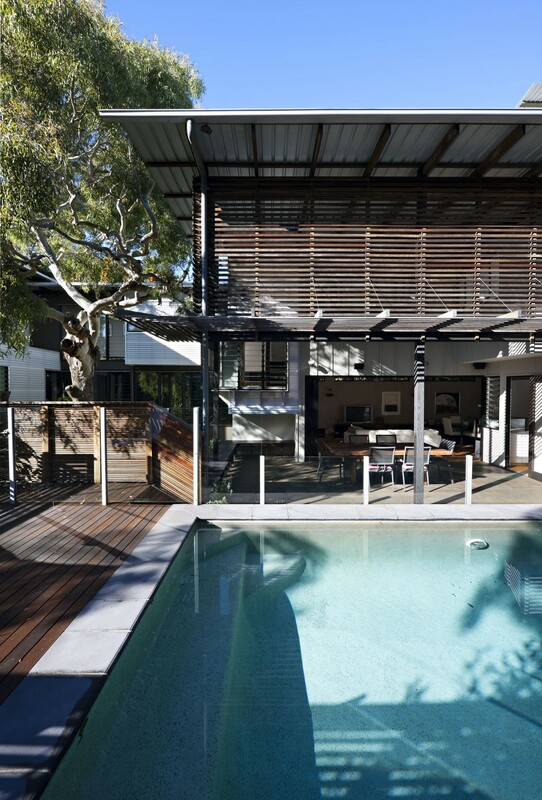 When approaching from the street, the sloping terrain naturally guides an axial timber boardwalk under a simple timber pergola structure arriving in the courtyard opposite the Morton Bay Ash. The main pavilion to the west accommodates living spaces focused around a double-height deck space overlooking the swimming pool and northern garden. 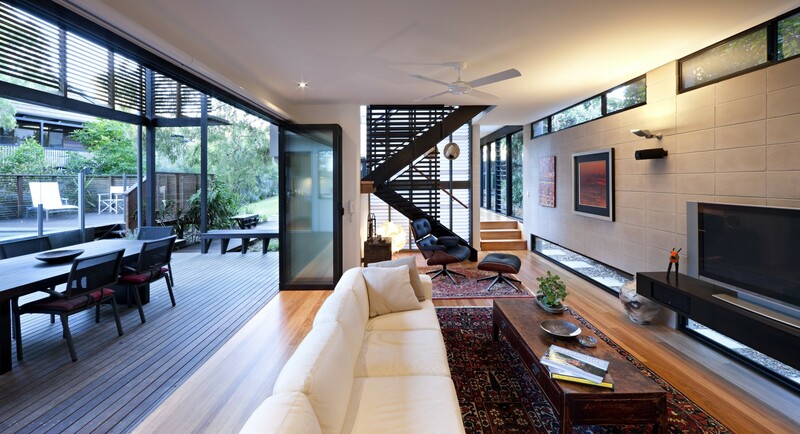 The connection between the deck and living space is dynamic and direct. 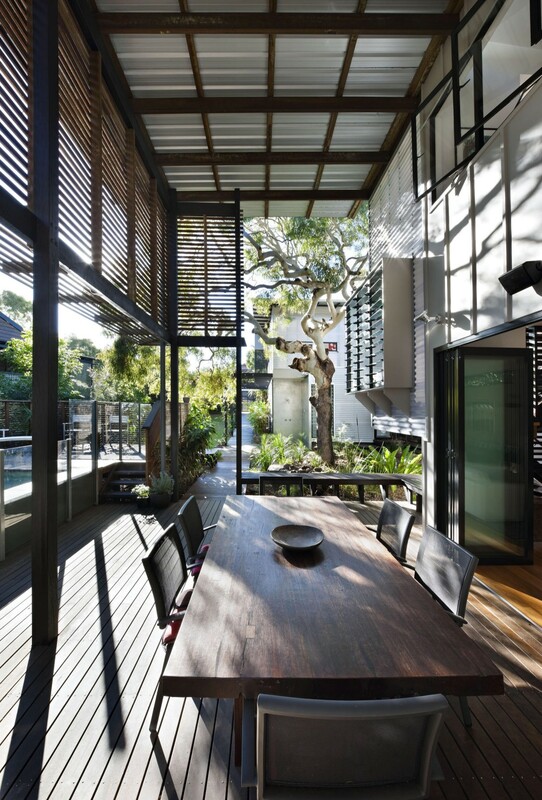 As the heart of the house, the covered double-height outdoor room is actively used all year round as dappled sunlight is filtered through a timber batten screen hung below the roof structure. 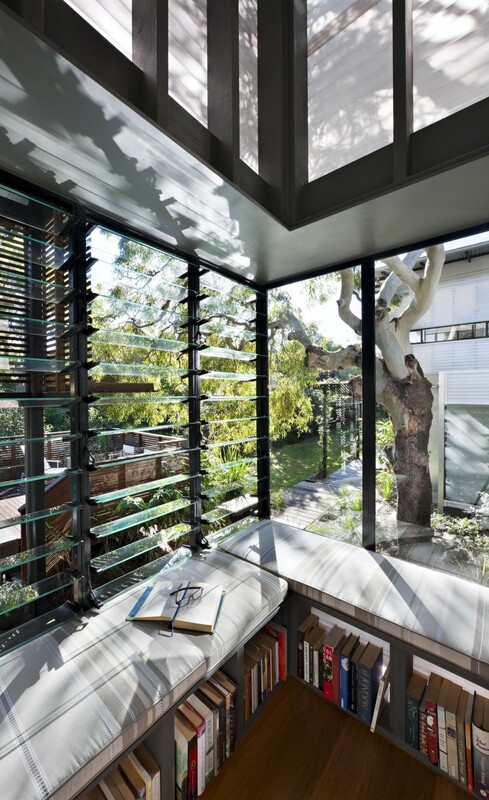 Indoor and outdoor realms are connected through an interlocking series of alcoves and nooks like a low edge deck seat and reading nook pop-out located off the stair landing. 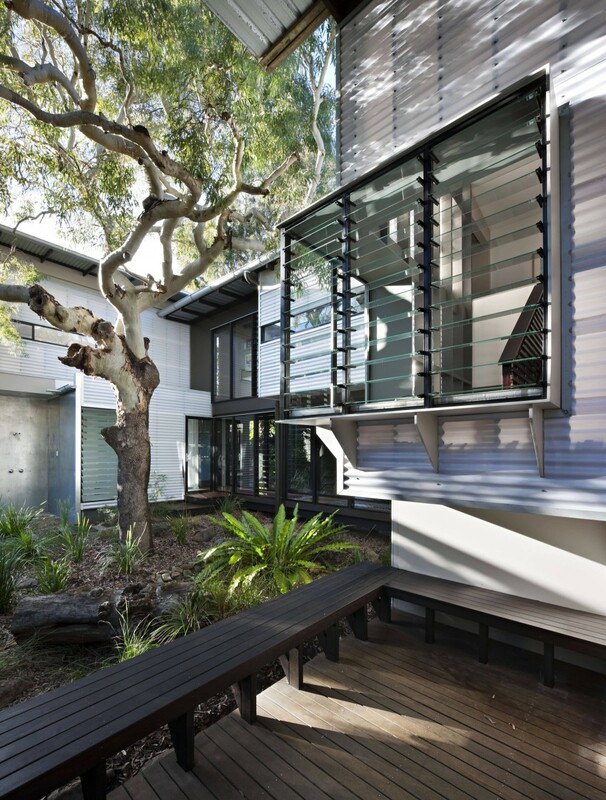 The courtyard and Morton Bay Ash are a focal point for almost all rooms within the dwelling to enjoy a connection. Responding to the needs of the home’s new residents, we have built into the original framework the recent additions of a ‘pop-out’ study room, an enclosed passage link below the bridge, plus laundry and powder rooms. 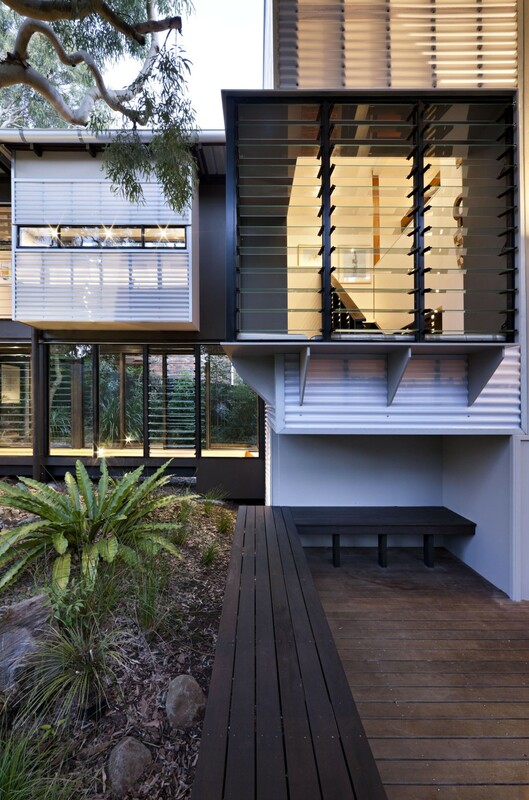 Providing extra amenities to the house, these additions also further animate the edges of the courtyard space. Sitting just 250 metres from the sea, you would think that this beach house is at its best during the hours of sunlight, but come sunset it is transformed into a gorgeous spectacle of its own. The master bedroom suite accessed by a polycarbonate clad stair tower may be a calm contemplative space by day, but by night it glows gently from within like a warm paper lantern, together with other illuminated points throughout the house and the soft blue-green light from the pool. The Morton Bay Ash casts its shadow onto the polycarbonate further animating the edges of the courtyard, bringing the landscape into the house. The result is truly impressive. Villa in Nature, "Villa in Nature"
Tropical Houses, "Living in Paradise"
Steel Profile, "Second Coming "
QANTAS In Flight, "Building Sandcastles"
Home Beautiful, "Meant TO BE"
Eco Maison Bois & Energies Renouvelales, "Sculptured with Nature"
Beach Houses Down Under, "Around a Moreton Bay Ash"
BRW - Sand Castles, "Tree House"
21st Century Sustainable Homes, "Modern Sustainable Home"